This 5 Days Chimpanzee & Gorilla Trekking Safari offers you a live experience of the world’s biggest primates, mountain gorillas and chimpanzees in the jungle. 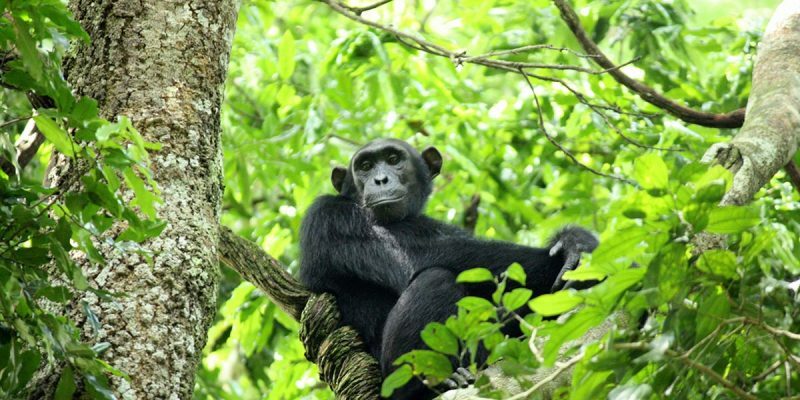 You’ll visit Uganda’s prime destinations – Bwindi Impenetrable National Park for mountain gorilla tracking and Kibale National Park for Chimpanzee tracking and 11 other primates. You drive through Queen Elizabeth National Park on your transfers. It is tailor-made and therefore subject to adjustment upon the client’s request to accommodate special interests. 5 Days Chimpanzee & Gorilla Trekking Safari is one the main luxury trips organised by gorilla safaris Uganda. A tour agent/guide from GS Uganda Limited will pick you up from the hotel or guesthouse of your choice and leave for Kibale Forest. In the afternoon we will arrive at Kibale Forest Camp, sleeping with the noises of the tropical Rain forest. You’ll stay at Chimpanzee Guesthouse, overlooking Nyabikere Crater Lake. The lake is famous for the frogs: at night they always give a beautiful concert. At 8.00am we will start with 4 hours chimp tracking – during which you may also get to see 10 other primates! Kibale park is also known for all the butterflies and birds. In the afternoon we will walk through Bigodi Swamp (home to a community based project). Early in the morning we will leave for Kisoro. We will cross Kazinga Channel, traveling through Queen Elizabeth Park, and reach Kabale in time for lunch. From Kabale we will continue through a beautiful landscape also defined as the “Switzerland of Africa”: mountains, lakes, hills with cultivated terraces, tropical rain forest and bamboo forest. On the last hill the landscape unfolds beneath us, taking in the vast planes between Uganda, Rwanda and Congo, with the Virunga volcanoes dominating the view. At the bottom of the valley is Kisoro, where we will stay at the famous Travelers Rest Hotel. In the sixties the famous American ‘gorilla-woman’ Dian Fossey visited the Travellers Rest Hotel many, many times to do paperwork, relax or meet people. Fossey said about the hotel: “It was my second home”. Travellers Rest Hotel is just outside Kisoro and offers a cozy stay for the tourists coming to see the endangered mountain gorilla. The hotel, built in a somewhat colonial style, and entirely renovated in 1999, has a comfortable ambiance. The day of gorilla tracking, you will travel by car from Travelers Rest Hotel in Kisoro to Nkuringo, in the southern part of Bwindi Impenetrable Forest National Park (1hr). Once there you will first receive a briefing (7.45am) and at 8.30am you will start the tracking. Once you have found the gorillas, you will be able to spend up to one hour with them! You will be expected back to the starting point by 7.00pm at the latest. physically conditioned peoples are recommended. Early in the morning after breakfast you will travel back to Kampala. On the way back to the city you will have lunch in Mbarara town, and after Masaka there will be an opportunity to a stop at the Equator for photo shoots and buying souvenirs and have tea or coffee. We will then bring you back to Kampala or Entebbe for your flight back home and marks the end of the Safari Tour.